It’s getting on for three years since Borderlands 2 was released. In that time we’ve had 12 bits of DLC, a pre-sequel, and even a Telltale adventure game set in the Borderlands universe but no straight sequel. Gearbox announced at PAX over the weekend that they’re finally ready to begin. 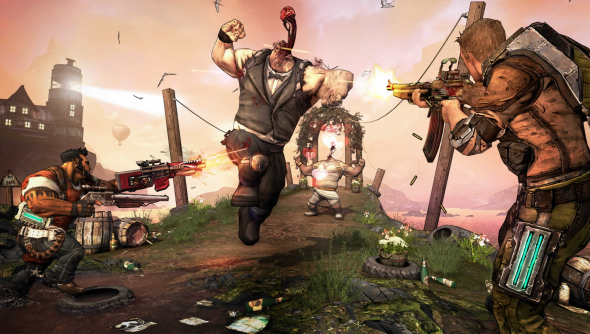 “People think we’re already working on a new Borderlands game,” Randy Pitchford, Gearbox’s CEO. “The fact is we aren’t but we want to and we want to get started soon. Pitchford suggested that Borderlands 3 will be significantly larger than the previous games and the studio will need to hire a lot more staff to make it happen, saying “We want to think about the future and we want to think about what the next Borderlands is and we’re going to need some help.” Gearbox have posted a stack of new jobs to the jobs page. they’re looking for everything from writers, to artists, to server programmers, to level designers so if you’ve been wanted to break into the industry it’s worth having a look. Gearbox are currently wrapping up work on the remastered Homeworld games, which will be out this February, and quietly working on Battleborn.